Maggie’s frenemy Hastiin asks Maggie to assist Hastiin and his Thirsty Boys in a bounty-hunting foray. They’re targeting White Locust, one of many self-appointed prophets to appear after the collapse of civilization. The foray goes poorly. The expedition walks into an ambush that leaves Hastiin dead, the Thirsty Boys with a hard-to-hold prisoner, and Maggie tasked with mentoring Hastiin’s niece Ben. Maggie returns home to learn that followers of the White Locust seem to have kidnapped Maggie’s estranged friends Kai Arviso and Caleb Goodacre. That is one interpretation. Caleb’s siblings Rissa and Clive suspect that Kai might have helped kidnap Caleb. It certainly seems as if Kai left of his own will, while there’s evidence that Caleb resisted. Ben, Maggie’s mentee, also has clan gifts. She is an unparalleled tracker. She can track Kai and Caleb. But that will take Maggie and Ben outside the Walls of Dinétah, where they will have to face the White Locust cultists. Cultists who believe that they can usher in a new world order by destroying the last remnant of the old one: the Dinétah. Jumping into a series on book two isn’t my preferred method. In this case it answers a pertinent question: can the book stand on its own or should the series be approached as a long story delivered in incomplete instalments? The answer here is that while there seems to be an arc for the series as a whole, it takes the approach common to many mystery series: each book has a complete plot. Obviously the only correct approach2. The setting is near-future post-apocalyptic, a genre I admit is not one of my faves. In this future, urban intellectuals like me have died unpleasantly to give heroes room to swing their swords. Which, BTW, is usually is a figure of speech, but there really is a sword in this book and it does get swung. This book also lies somewhere on the spectrum between outright superhero fantasy and urban fantasy/paranormal romance. In both settings, people with very special abilities struggle to fit into a world they never made. The difference between the two, it seems to me, is that superheroes are more likely to put the good of the many over their own likes or even their own lives; in urban fantasy, the protagonists may live on the wrong side of legal. Or worse, they may be sociopaths who are willing to engage in homicidal collateral damage to get what they want. The characters in this book are heroes. Maggie can be a fast and ruthless killer, but only when necessary. Collateral damage avoided. Usually white people do pretty well in post-apocalyptic novels. Maybe not the urban intellectuals, but isolated communities of the easily tanned survive and rebuild. Everyone else is swept off stage in a way that’s totally not the fault of the survivors. That’s not the case in the Sixth World setting. The white folks used to run the world and they trashed it, dooming themselves in the process. This has left the stable (mostly3)) community of the Dine to rebuild in their own, healthier, image. Fair enough, I say. There have been too damn many post-apocalyptic novels about white folk. Time to let someone else enjoy centre stage. This novel reminded me of the Andre Norton novels in which Native Americans have survived and thrived while their colonialist oppressors, not so much. But as fond as I am of Norton, I have to admit that Roanhorse is a better writer. She is also writing about a culture that she knows well, rather than making ineffectual gestures at inclusivity. I can recognize that superiority while admitting that this book just did not hit the spot for me — perhaps because I’m not fond of the genre. This may work for other readers. I hope I’ve given you enough info that you can figure out whether or not you’re one of them. 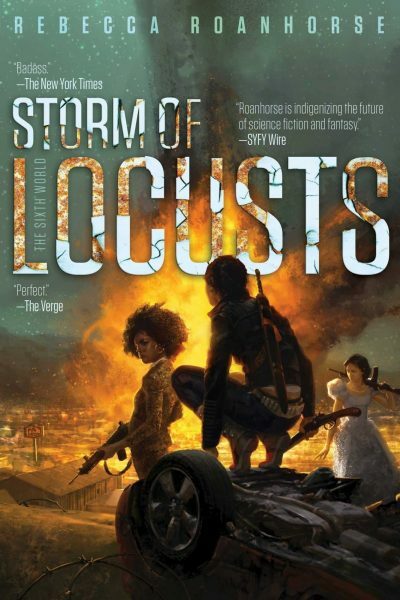 Storm of Locusts is available here (Amazon), here (Amazon.ca) and here (Chapters-Indigo). 1: I have not reviewed the first one, Trail of Lightning. 2: One reason standalone plots are the correct approach: if the author dies or just stops writing, at least there’s some closure. 3: The Dinétah isn’t rock-solid stable, given that it’s dealing with gods and monsters, but it’s way better than anything outside the Walls. Given this isn't a white-supremacist apocalypse (perhaps with the exception of whoever White Locust is, which incidentally doesn't sound like Mister Charisma to me), where in the world, literally, are we? Geographically? The book is set in what is now the US south west. Trail of Lightning Has Latinax people in charge of what's left of Albuquerque, seemingly in some sort of aristocracy or maybe something more Mob-adjacent. Black people appear in bit roles. The only White person mentioned died in the backstory.